The last we left Team Flash, they were congratulating themselves on their updated security system not allowing any more strangers coming through. Alas, Jay Garrick managed to slip through to warn Team Flash of a danger to their world. The episode opens mere seconds after Jay makes this declaration. Jay explains how he comes from another Earth where he was known as the Flash. Jay mentions how the Al Rothstein from his world came to Earth-1 while the Earth-1 version was found dead. At the time of the singularity that Barry opened, Jay was battling a foe called Zoom, also a speedster. Zoom was about to kill Jay when the portal opened up, sucked up his helmet first then himself. Jay has been in Earth-1 Central City for 6 months gathering intel about Team Flash before revealing himself. Unfortunately for Jay he has lost his speed power. Barry is immediately distrustful of the newcomer and asks Caitlin to run a series of tests. Meanwhile, Zoom, sporting a black version of the Flash outfit, emerges from a portal to bring in Eddie Slick aka the Speed Demon to kill Barry’s the Flash. As Caitlin performs tests on Jay, she learns that he’s been the Flash for two years and explains how he got his powers. The two bond over being scientists. Later Caitlin reports back to Barry and Iris Jay’s test results: he has a lower heart rate, low blood pressure, high oxygen levels, accelerated healing but no speed force. Also, Caitlin performed a lie detector test on Jay (unbeknownst to him) and he passed with flying colours. Meanwhile at the Central City precinct, Joe ignores a cell phone call when uniform cop Patty Spivot (Shantel VanSanten) asks to join Joe’s anti-meta human task force that currently has zero members. Patty lists all of her qualifications but Joe politely declines her application. Barry is still mistrustful of Jay and puts him the particle accelerator prison. Jay tries to convince Barry that he is here to help but Barry gets called away to a warehouse fire. When Barry arrives at the warehouse, he quickly puts it out but this fire was a way to lure the Flash there. The Flash battles the Sand Demon but is unable to defeat. The next day, Joe and Barry are investigating the fire and Barry cannot find any evidence. But you know who does? Patty, who shows the two men a pipe that was too cleanly cut and determines a meta human has done it. Fingerprints are found on the scene as well as some sand. Patty and Barry are introduced and Patty is fan girling over Barry. Not because Barry is the Flash (Patty has no clue) but over his forensic reports that she has read. Patty hopes her help will convince Joe to let her in on the task force but alas no. Patty then asks Barry to convince Joe to turn his no upside down but even Barry doesn’t know how. Also to show how the Arrow and The Flash universes are connected, the STAR lab folks are watching a news report of Oliver’s TV transmission proclaiming he is the Green Arrow. Let’s see if Supergirl will show any connection because supposedly it too lives in the same universe. When Barry returns to STAR Labs with a vial of sand, Jay, who is out for more tests, says that it isn’t sand but actual human cells. Cisco takes it down to another lab for further investigation and comes across Stein going over calculations to explain the breach. Stein explains his theory to Cisco and the two nerd out. While Stein goes off to investigate further, Cisco uses a microscope to investigate the sand. However, when Cisco goes to touch the sand, he gets a vision of the Flash battling the Sand Demon and this freaks Cisco out. Caitlin and Iris don’t understand why Barry won’t accept Jay’s help. Iris asks to speak to Barry alone and wonders what happened to the Barry that she knew, the one that trusted people. Barry explains the last person he trusted was Harrison Wells and because of that trust, Eddie is dead and Ronnie too. Thanks to the fingerprints, Joe finds Eddie Slick but when he gets made, Slick runs off but doesn’t get very far thanks to Patty. Joe questions Slick while Patty and Barry watch. Barry says he will put in a good word for her to Joe. After questioning Slick, Joe tells Barry that he wasn’t in Central City during the night of the particle accelerator explosion so they have to let him go. Just when Joe releases Slick, he comes back again but we all know that this Slick is from Earth-2 and knocks Joe out and grabs Patty as bait to lure the Flash out. Barry learns that Patty has been kidnapped and finally lets Jay help the team. First off, Jay says he needs to be lured in a place of humidity that will affect his powers. Alas, Team Flash are coming up empty on possible locations. So Jay tells Barry that he must hit Sand Demon with a bolt of lightening that he can create after running really fast to turn him into glass. Barry is still reluctant to accept Jay because Wells tried to teach him to be faster, to be a hero but he was the man that ended up killing his mom. Jay says that he isn’t that man and we see Barry take slow steps to welcoming his help and the two go off and train. Meanwhile, Patty taunts the Sand Demon saying the Flash will rescue her and the concussion bomb he is building won’t hurt him, Sand Demon knows that as the bomb is meant to hurt her. At an impasse as to where Sand Demon and Patty could be, Cisco taps into his Vibe power and gets a location and what the villain’s plan is. Cisco and Stein rush to where Barry and Jay are training to tell them of his hunch. The plan is that two Flashes will face Sand Demon since Jay has faced him before and he doesn’t have to know he has no powers. The only thing Jay needs is his helmet, which luckily STAR Labs has. The Flash — “Flash of Two Worlds” — Image FLA202A_0326b — Pictured (L-R): Teddy Sears as Jay Garrick and Kett Turton as Eddie Slick — Photo: Cate Cameron/The CW — ÃÂ© 2015 The CW Network, LLC. All rights reserved. 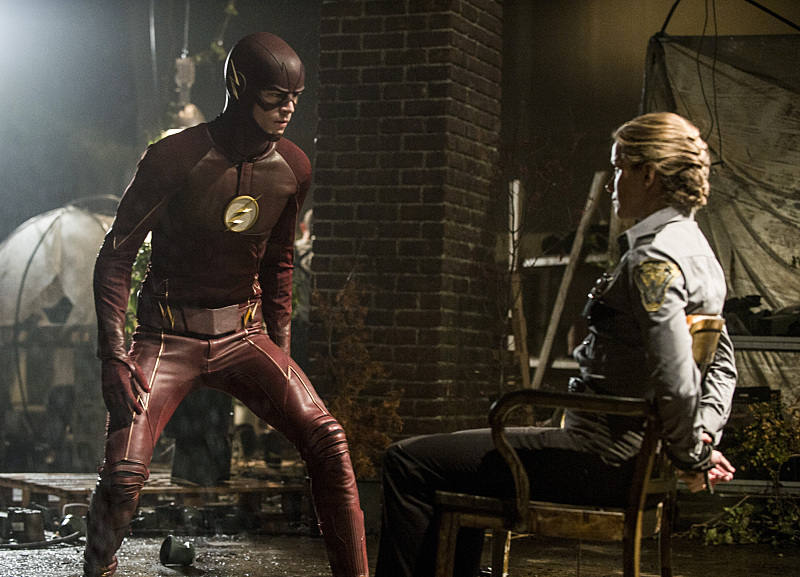 The Flash — “Flash of Two Worlds” — Image FLA202A_0016b — Pictured (L-R): Grant Gustin as the Flash and Shantel VanSanten as Patty Spivot — Photo: Cate Cameron/The CW — ÃÂ© 2015 The CW Network, LLC. All rights reserved. At the warehouse, Jay confronts the Sand Demon who quickly realizes that Jay has no powers. While choking Jay, Barry comes in to rescue Patty. Barry does manage to rescue her but the concussion bomb goes off too. The blast knocks everyone down. The Sand Demon sees his real target and goes in for the kill but Barry harnesses his speed to shoot lightening and defeats him. When Patty comes too, she calls for the Flash, which both Jay and Barry respond to and we get the recreation of a classic The Flash comic cover. At STAR Labs, Caitlin helps bandage Jay up and the two bond further over losses. Caitlin tells Jay that it gets easier as time goes on to learn to live in the new reality. Something tells me that they are pushing something romantic between these two. Patty returns to work and Joe finds out why Patty wants to be on the task force: Mark Mardon aka the Weather Wizard. Apparently, Mardon killed Patty’s father in a bank robbery and a few months later ended up with super powers. Patty wants to put meta humans away. It is this determination that gets Patty a spot on the anti-meta human task force. And so far I am liking VanSanten as Patty Spivot. Also showing up at the Central City precinct is Joe’s ex-wife (Vanessa Williams – not that one but the one that was on Melrose Place) asking to see her daughter Iris. Back at STAR Labs, Stein forces Cisco to tell him the truth about his powers. Cisco spills the beans and is afraid that he will become a villain and begs Stein not to say anything to the team. At the Cortex, Barry finally welcomes Jay to Team Flash. Stein and Cisco share what they found about the breach and discover many breaches (52 to be exact) and that the biggest breach is underneath STAR Labs. Stein doesn’t get to finish his findings when he starts to have seizures. Perhaps this is a side effect of not having his other half. In the coda, we are on another Earth and a tour guide is giving a group of school kids a tour of STAR Labs (in actuality it’s inside the Queen Elizabeth Theatre here in Vancouver). The tour guide starts to mention meta-humans when she stops to introduce the kids to the founder of STAR Labs and the man that saved Central City: Harrison Wells! Now I am not sure which Harrison Wells this is but it sure seems like the evil Harrison Well aka Eobard Thawne. Also, I have a theory as to who is Zoom. We know Tony Todd is his voice but I have a feeling the physical body will be Eddie! What do you think? Sound off in the comments.